The collective wisdom from popular media seems to be that the Oregon Ducks football team will take a step back in 2015. On January 19, ESPN’s Ted Miller predicted that the South Division will produce the Pac-12 football champion next season. Other recent articles have focused on how Oregon must improve, or adapt, in the post-Marcus Mariota era to repeat as kings of the conference. So in true FishDuck fashion, we provide the rebuttal. 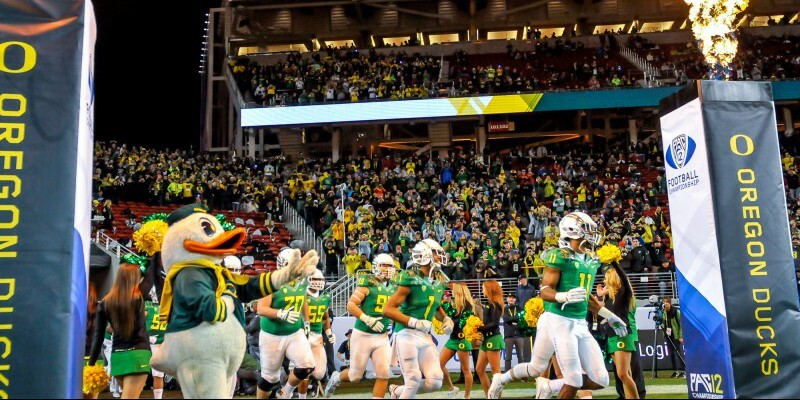 Here are three reasons our beloved Ducks will stay atop the Pac-12 pecking order in 2015. All-American center Hronis Grasu, all-conference left tackle Jake Fisher and two-year starting guard Hamani Stevens all exhausted their eligibility on January 12 in Arlington, Texas. So, 2015 should be a transition year for the big uglies, right? Tyrell Crosby should take a big step forward in 2015. Think again. Oregon returns a combined 65 starts up front in 2015, including rising junior Cameron Hunt (20 starts), who has started since the second half of his freshman season, and Tyrell Crosby (eight starts), who should be significantly better as a sophomore, after a year in Oregon’s successful strength and conditioning program. Further, the Ducks return Tyler Johnstone (26 starts), an all-conference left tackle who would have been Oregon’s second-best offensive lineman last season behind Grasu, had he remained healthy. If Johnstone is fully healthy next season, as he should be, he is probably a slight upgrade over Fisher. Matt Pierson (7 starts) also returns and will likely challenge for a starting spot after improving significantly in a 2014 baptism by fire at right tackle. Andre Yruetagoyena (2 starts), who also returns, actually won that job out of fall camp, but he missed most of the season with a knee injury before returning to play a key role off the bench in December and January. Fans should not be surprised to see either “Andre Y” or Pierson slide down to guard and lock up a starting spot opposite Hunt. Finally, Jake Pisarcik (2 starts) saw a good deal of action last year and should be much better in his second year on the field. Pisarcik and Doug Brenner (1 start) will battle for the task of replacing Grasu. 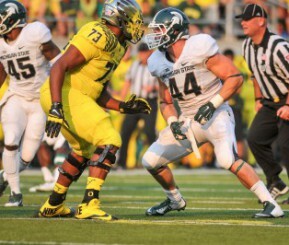 Overall, Oregon has seven offensive linemen with significant playing experience heading into next season. Given the rash of injuries to this unit last year, the offensive line should be much better, and more consistent, in 2015. This one is obvious, but nonetheless true. The Ducks return freshman phenom Royce Freeman, who only had the best true freshman season in Oregon history. Freeman was voted Pac-12 Freshman Offensive Player of the Year after rushing for 1,365 yards and 18 touchdowns. 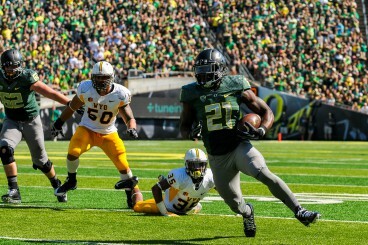 Thomas Tyner, however, figures to push Freeman for carries. Finally healthy for the College Football Playoff, the native Oregonian averaged 7.4 yards per carry over the final two games of the season, and looked every bit like an all-conference running back. Freeman returns as the Oregon bell-cow next season. Behind these two workhorses, the Ducks still have Byron Marshall, the team’s leading rusher in 2013, who will continue to see spot duty in the backfield despite moving to wide receiver, where he has similarly excelled. Scout team sensation and former four-star recruit Tony James will come off his redshirt year itching to see the field. Finally, Oregon is bringing in DAT 2.0 in Georgia product Taj Griffin, whom the Ducks may redshirt given all of the names in front of him, and given that Griffin is coming off an ACL surgery. There is not a backfield in the country as deep and talented as Oregon’s next season. With the talent returning along the offensive line, the embarrassment of riches in the backfield, and the fact that Oregon is replacing its own Roy Hobbs in Mariota (who is replaceable, by the way—Tennessee won a National Championship the year after Peyton Manning graduated), expect Oregon to return to more of its run-dominant ways of years past and be among the nation’s elite on the ground in 2015. This will allow Oregon to continue to control pace and tempo offensively, which has been the hallmark of its success for the past eight seasons. This may seem somewhat trivial, but fans would be unwise to underestimate this factor. 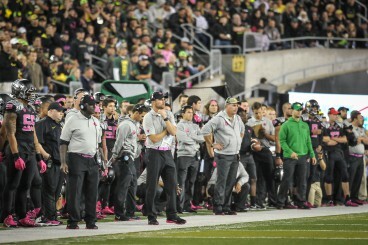 Two years ago, the Oregon program had to replace its head coach and innovator, Chip Kelly. Last season, Oregon had to spend the offseason replacing long-time defensive coordinator Nick Allioti. While fans expect a seamless transition, the reality is that coaching changes create bumps and uncertainty for a program. In hindsight, it is hard to ask for much more from the Ducks in managing major coaching upheavals in two straight seasons. In 2015, there will be no such major staff overhauls to contend with (knock on wood). The coaching staff returns intact in 2015. The 2015 team—coaches and players alike—will not have to adjust to a new personality and new quirks in the system for the coming season, as head coach Mark Helfrich and defensive coordinator Don Pellum are now entrenched in their new, authoritarian positions on the staff. Thus, the staff and players will be that much more on the same page for spring ball, and for the start of fall camp. The improvement fans saw in the Oregon defense during the second half of the 2014 campaign was certainly a product of Pellum’s adjustment to his coordinator role, as evidenced by his alteration of the linebacker rotation down the stretch. Pellum will need no such adjustment in year two, and Helfrich will be all the more comfortable in year three as the head man. This should translate to a more prepared, more disciplined team come next fall, especially early in the season. And the more prepared and disciplined the team is in September, the further advanced it will be in November and December, when things get really serious (and really crazy) in college football.